21. marca 2019. 22. marca 2019. V teh dneh smo praznovali godove dveh pomembnih svetnikov. V nedeljo smo se spomnili sv. Patrika, ki je zavetnik Irske. Ker od tam izvira tudi naša vzgojiteljica Ruth Conroy Bartolj, so otroci pri angleščini spoznavali irsko kulturo in njihove navade. Zato je v teh dneh naš vrtec odet v zeleno barvo in okrašen z deteljicami. Na praznik sv. Jožefa, ki je zavetnik tudi našega pastoralnega doma, v katerem deluje vrtec, pa smo se nekateri odpravili k sveti maši, pri kateri je lepo prepeval naš vrtčevski zborček. St Patrick’s Day is on the 17th of March and is the traditional date of the death of St. Patrick. It is the day Irish people celebrate their patron saint and their ‘Irishness’. St. Patrick (who was actually Welsh) brought Christianity to Ireland. It is said he used the shamrock (a species of young clover) to teach the idea of the Holy Trinity. It is also said that he banished the snakes from Ireland! It is a very important cultural day for Irish people and people of Irish origin and is celebrated all over the world. With our teacher from Ireland we celebrated the week before (and the week after!) 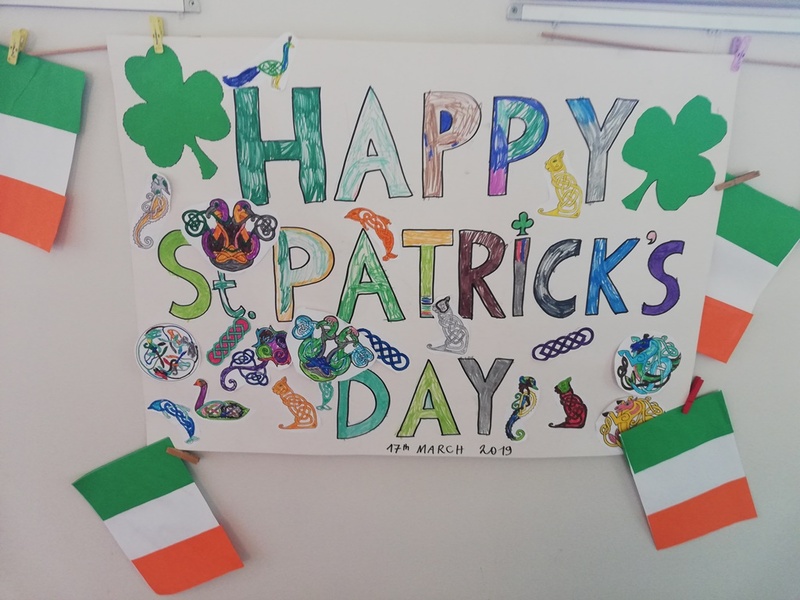 by talking about Ireland: where it is, what languages they speak, their flag and their culture. We made Irish flags and discussed the meaning of the colours: the green represents the Irish Roman Catholics and the orange the Protestants. The white represents the peace between them. We talked about Irish folklore including fairies, leprechauns and banshees. We tried out some Irish dancing and coloured in animal celtic designs. And of course we spoke about St. Patrick.